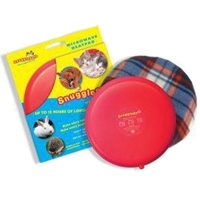 Snugglesafe Heat Pad and Cover is a microwavable heatpad for your cat or dog that can be ready for use in just 6 minutes. Snugglesafe heat pads are designed to maintain a stable temperature of 52 degrees Celsius and will provide constant warmth for up to 12 hours when placed in cover or under the pet's blanket. Snugglesafe heat pads are bite-resistant and scratch-resistant. It is always recommended to have a barrier such as a blanket between your pet and the heatpad. The heatpad requires no water filling, contains non-toxic gel, has no electrical wires, bite-resistant and comes with a free cover. Just warm the SnuggleSafe Heat Pad in the microwave for a few minutes, use microwaves of power output between 600 and 1400 watts. Do not use in microwaves which "hotspot".